WHAT IS CEREC? CEREC is an exciting new treatment method making crowns, veneers, and bridges faster and easier. With Invisalign, the aligner trays are not only smooth and comfortable to wear, but they're also removable. We know your time is valuable. That’s why we offer CEREC technology that allows for a faster experience when you need crowns, ﬁllings or veneers. With CEREC, there’s usually no need for a temporary and return visit. Everything is done in one visit, in about an hour – leaving more time for whatever is important to you. We want to offer you not just one more reason to smile, but many more reasons to smile. Starting with a friendly, welcoming team approach, where patients come first, through investing in the newest technology; we believe in serving each unique patient with personal attention and the best possible treatment options geared to his/her specific needs and wants. O’Bryan Advanced dentistry is a full spectrum dental office covering services from Cosmetic, Restorative, and Preventative Dentistry to Dental Implants and use of the CEREC technology offering Same-Day Crowns. O'Bryan Advanced Dentistry will be located at the newly renovated Pacific Coast Medical Park, 1957 Thompson Road, just 2 blocks west of Bay Area Hospital. We are just inside the Main Entrance, behind the wall of windows. While you are there be sure to check out the new Pacific Coast Gallery featuring larger scale works. Click here to see the schedule. What a great experience for a dentist visit. I walked out of the office with my new crown and a smile on my face." -- Larry M.
Because Dr. O’Bryan works with you to develop a treatment that suits your needs and stages that treatment to work within your budget! No surprises!! Because, while dental drilling is not fun, it helps when the people doing it are friendly, confident, and exceptionally good at their jobs. Because patients don’t have to be sent to Eugene of further for treatment. O’Bryan Dentistry meets your dental needs from simple fillings through cosmetic dentistry, implants, and emergency procedures! Because O’Bryan Dentistry offers one visit crowns, implants to anchor dentures or replace individual teeth, invisilign braces for adults, and special cosmetic procedures to make your smile the smile you want! Because the team at O’Bryan Dentistry are helpful, knowledgeable, and on your side in dealing with a wide variety of insurance plans. "In Their World," the new exhibit at Pacific Park Gallery, celebrates the animals—wild and domestic—that share the planet with us. Pacific Park Gallery brings a menagerie of animal art to its walls August through October. The works of art catch our planet partners in moments of their daily lives. Swimming, flying, dining, sleeping, and pondering animals are captured in the moment, in their worlds, with charcoal, pencil and paint. 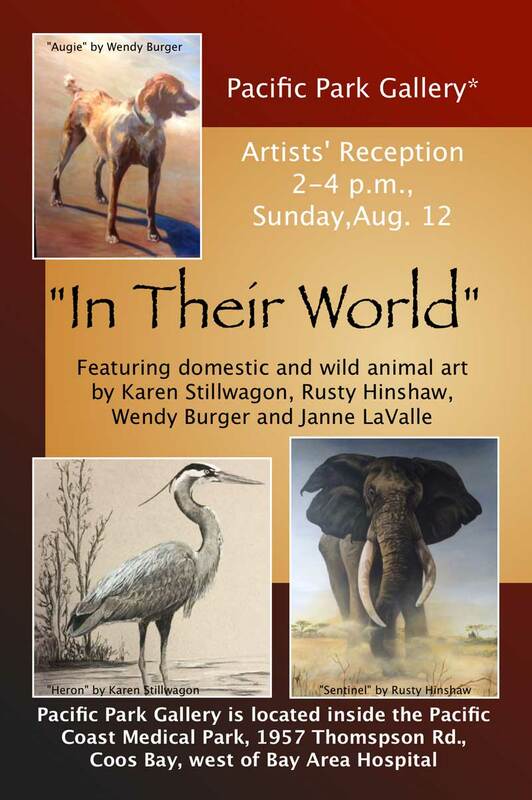 Artists Karen Stillwagon, Rusty Hinshaw, Wendy Burger and Janne LaValle will welcome animal and art lovers at the Artists' Reception 2-4 p.m., Sunday, August 12, at Pacific Park Gallery, 1957 Thompson Rd., Coos Bay. They will be joined by The Match Girls performing on dulcimer hammer, wind and string instruments. The reception and concert are free and open to the public.